One of bouldering’s many attractions is that it doesn’t require a lot of equipment. To boulder indoors all you need are a pair of climbing shoes and some chalk, while bouldering outdoors requires a few extra items most critically a bouldering pad. If you are venturing off the beaten track, you should also take a map and compass, food, water, warm clothes and a head torch. A tight fit gives better performance on small holds at the expense of comfort. The stickier the rubber, the faster it will wear out. Stiff shoes ‘edge’ well but ‘smear’ badly. Thin soles are more sensitive but less durable. Most beginners’ footwork is such that their first pair of shoes don’t last long, so there is no point spending a fortune on them. Fit your shoes so that they are snug but not painful. While a chalk bag isn’t absolutely essentials indoors (you could just use the bag your chalk came in). Outdoors you are much more likely to wear your chalk bag as you climb so you will need a chalk bag. A small piece of carpet is very useful for cleaning your shoes before you step onto a problem. Excess chalk is easily removed with a brush. There are a variety of fancy bouldering brushes on the market, however a plastic bristled washing-up brush works just fine. Some climbers use a telescopic pole with a brush attached to the end to clean out of reach holds. Alternatively, just tape your brush to a stick. Never use a wire brush as the metal bristles destroy the rock. 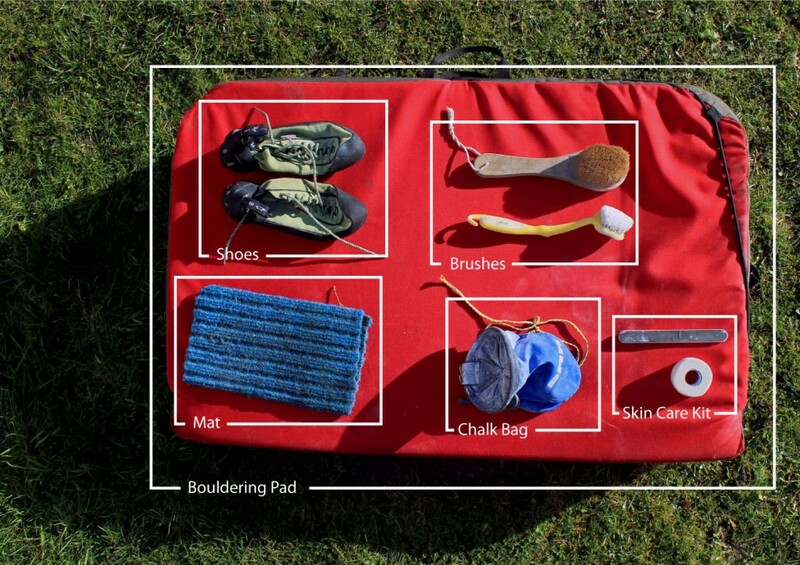 A bouldering pad is pretty essential for bouldering outdoors especially if the landing are rocky or the problems are high. Most pads consist of a thick layer of soft foam and a thinner layer of hard foam. The hard foam is usually on top (i.e. the side you land on) as this spreads the impact which is then absorbed by the soft foam. They vary in size and the most suitable pad for you depends on factors such as how far the walk is, how high the problems are, if you boulder alone, how big your car is etc. Alpkit offer an excellent range of pads at good prices. Posted in Blog, Bouldering Essentials.